SpeedFan is a freeware program that monitors voltages, fan speeds and temperatures in computers with hardware monitor chips. SpeedFan can even access S.M.A.R.T. info for those hard disks that support this feature and show hard disk temperatures too, if supported. SpeedFan can even change the FSB on some hardware (but this should be considered a bonus feature). 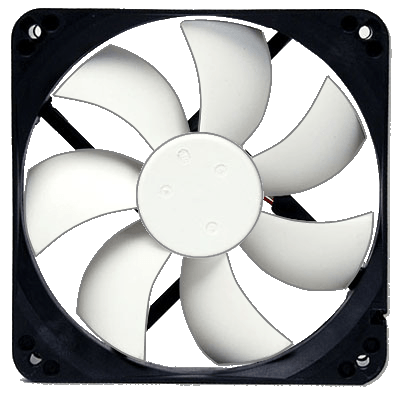 At the lowest level, SpeedFan is an hardware monitor software that can access temperature sensors, but its main feature is that it can control fan speeds (depending on the capabilities of your sensor chip and your hardware) according to the temperatures inside your pc, thus reducing noise and power consumption. Several sensors, like Winbond's and the AS99127F support fan speed changing, as well as others from Maxim, Myson, Analog Devices, National Semiconductor and ITE, but the hardware manufacturer must have connected the relevant pins to some additional, yet trivial, circuitry. This means that if you have, say, a Winbond W83782D on a BP6 then you're ok, but not every motherboard with such an hardware monitor chip will be able to change fan speeds. From one of the very first hardware monitor chips that could be found in standard PCs, the National Semiconductor LM75 (and all of its clones, like the Philips NE1617 and the Philips NE1618 or the Maxim MAX1617) or the Analog Devices ADM1021, such chips have been greatly improved, both in their precision and in their capabilities. Current chips can monitor fan speeds, voltages and control fan speeds bu using PWMs (Pulse Width Modulation). Some chips can even be programmed to vary fan speeds without any additional software intervention. If your BIOS was programmed to setup such chips this way you can still try to use SpeedFan's Advanced Configuration to revert to manual (software controlled) mode. Winbond W83697HF, Analog Devices ADT7463, SMSC EMC6D102, ITE IT8712F, National LM85C and Maxim MAX6650 are very good candidates. Some SuperIO chips include temperature sensors too. SpeedFan can automatically detect them and use their features. The most used are National PC87366 and all of SMSC LPC SuperIO chips. SpeedFan can find almost any hardware monitor chip connected to the 2-wire SMBus (System Management Bus, a subset of the I2C BUS) Serial Interface and to the ISA BUS. SpeedFan works fine with Windows 9x, ME, NT, 2000, 2003 and Windows XP. SpeedFan can be minimized to the tray and is compatible with Motherboard Monitor 5. Added support for Intel 8 Series SMBus. Added support for Intel 9 Series SMBus. Added full support for Nuvoton NCT6791D. Improved external USB hard disk detection on Windows 8. Completely rewritten 3ware RAID support (now it works on 64 bit systems too! ).